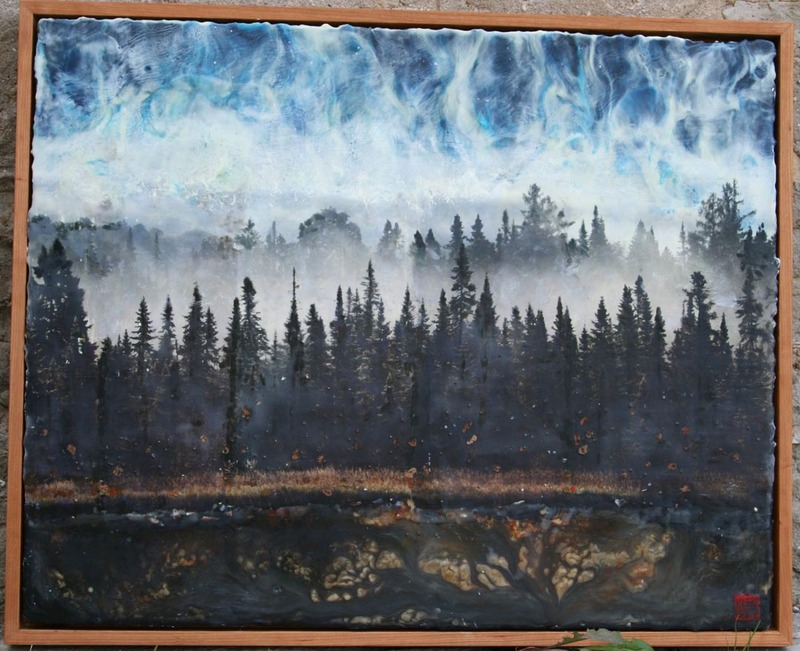 Tania Wycherley's art work above and below, encaustic mixed media using large image transfer techniques. 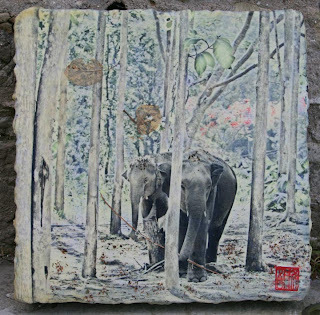 For the longest time I have admired Tania's tree pieces..she has been one of the first people I know to use these tree images in a beautiful poetic manner and captures the light behind the trees and the magic of the forest. I remember first setting my eyes on her beautiful work in 2007, and was so pleased when she wanted to do a trade with me for my work too. 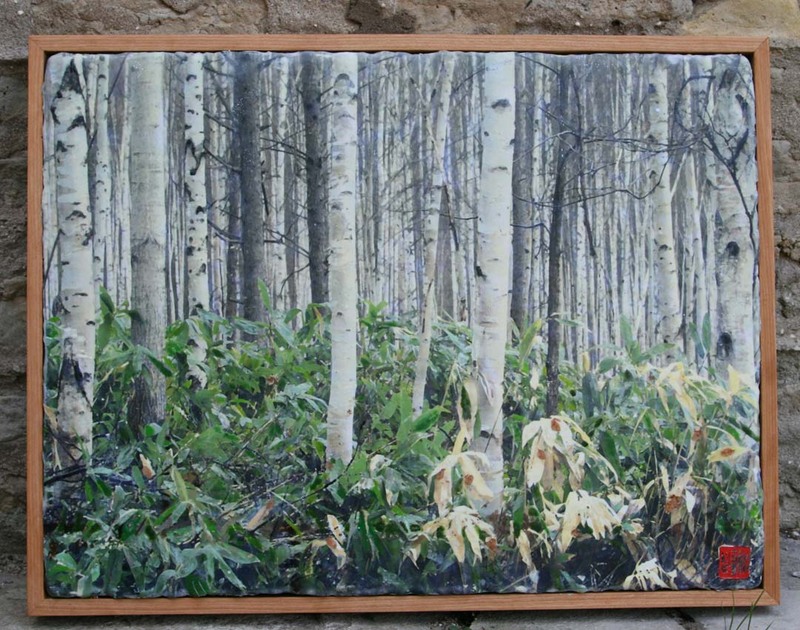 She has only grown even better in doing what she does, fine tuning the 'image transfer process' using her own photographs and working large. The image transfers she works on is larger than the 'standard' print size of 11 x 17. She has demonstrated this technique at the Fifth International Encaustic Conference this year, 2011 and will be turning this great demo into a full blown day long hands on class at Supria's Designs, on Sat. Oct. 22nd. 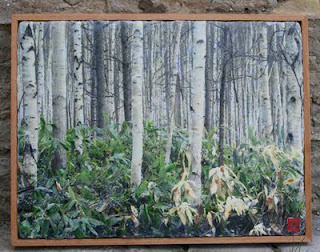 For more on Tania Wycherley and her work visit her website. Tania will be teaching the following class on Sat. Oct. 22nd 10- 4, space is limited, small class size to enhance the learning experience, creativity and fun - description below, to register or for more info. This session will demonstrate how to transfer toner images that exceed the 11x17 inch paper size barrier. We will discuss computer software to help with sizing as well as printing options. Burnishing techniques to create near-seamless image connections as well as tools and tricks to blend any resulting lines will be demonstrated. Participants will then be guided through the steps in completing their own enlarged image on either an 18x14 or 16x16 sized panel. Another great opportunity arrives Sat.Sept. 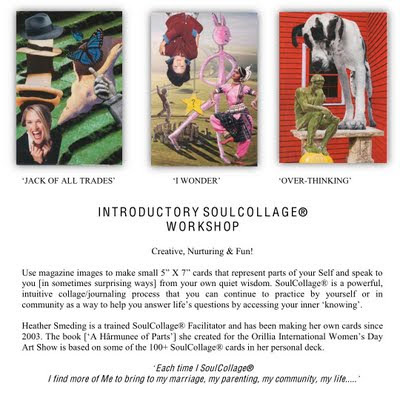 17th, 10- 4 ...Heather Smeding, will be teaching "Soul Collage"
Use magazine images to make small 5” X 7” cards that represent parts of your Self and speak to you [in sometimes surprising ways] from your own quiet wisdom. 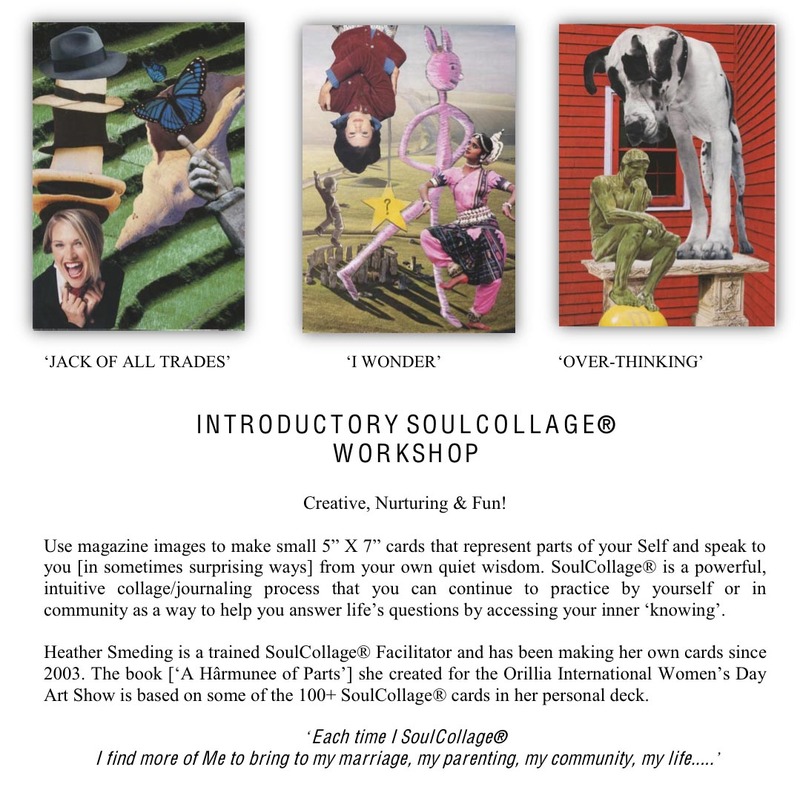 SoulCollage® is a powerful, intuitive collage/journaling process that you can continue to practice by yourself or in community as a way to help you answer life’s questions by accessing your inner ‘knowing’. Heather Smeding is a trained SoulCollage® Facilitator and has been making her own cards since 2003. The book [‘A Hârmunee of Parts’] she created for the Orillia International Women’s Day Art Show is based on some of the 100+ SoulCollage® cards in her personal deck. Thank you for sharing this beautiful, magical art. I get lost in the images because I get a strong feeling I am hiding in the trees watching the action. I wish I lived close enough to join in on the classes! wish you did too...I would love to meet you..thanks for your comment and stopping in to look and share a comment. Your blog has forced me to look in to your working methods, I wasn't familiar with encaustic before and I am always on the look out for new tasty offerings to feed my all consuming visual diaries, so thank you . Supria-beautiful post. Tania's 3 works are stunning. Thanks so much for showcasing her talents. Wish I was closer to attend all of these workshops! Wonderful work. Too bad you are so far away from NYC or I would be there in a second.